2009 will be a year of slump and war. Large parts of the population of Europe feels themselves to be unrepresented as these dire developments unfold. There is clearly a vacuum in official politics, which has proved itself incapable of defending peace, jobs and democracy. But alternatives are beginning to emerge. From its exciting beginnings in Germany, the movement to create Left Parties … has been steadily advancing. Die Linke, the German Left Party, is led by Oskar Lafontaine, the SDP's candidate for Federal Chancellor in 1990, and Lothar Bisky, former Chairman of the Party of Democratic Socialism (PDS). 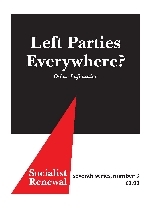 Left Parties are now appearing all over the place. These developments will give especial importance to the European Elections which are to be held in June 2009. The full text of this title is available from the Spokesman Books website.